The Kvennan fly fishing zone is 15 km long. This special section of the river Glomma holds an incredible population of wild grayling. Incredible both in numerous and in size. The fly only zone started in 2006. Since then the development in the river has been very good and the fish grows bigger every year. Learn more about Kvennan Fly Fishing at Kvennan.com. Check out the latest fishing conditions on Fishing reports. Fishing license can be bought online or at the Kvennan campsite. The number of day licenses are limited. You can buy fishing license online at Scanatura.no. In the region around Kvennan Camping there are several other good fishing possibilities. In Glomma the zone upstream and the zone downstream from the fly fishing zone are managed by the Kvennan Fly Fishing boarder organization. This is Tolga zone and Tynset/Tunna zone. 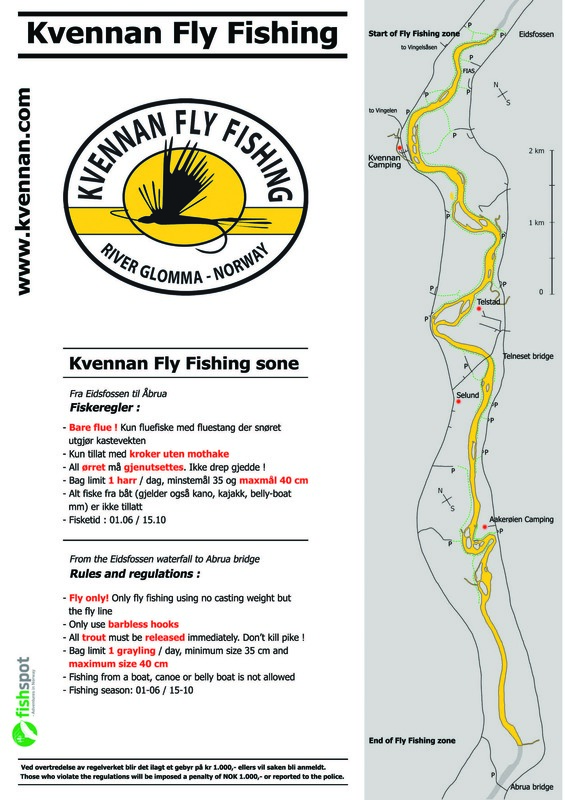 These zones are included when you buy the license for the Kvennan Fly Fishing zone or they can be bought separately. There are also good opportunities East from the village Tolga, here you’ll find the Hodalen Lakes. The most common catch here is grayling, pike, trout, perch, and white fish. There is one fly only zone in the Hodalen Lakes, called Drengen. In front of the campsite we have a guest zone. Here it is only allowed to fish from the riverbank, no wading. You can use different fishing tackle like lures, spinner, worms and of course fly fishing. Children under the age of 16 fish for free in the Camping Zone. The bag limit is two graylings under 40 cm a day, and all trout must be released immediately. The intention for the zone is gain interest for fishing, especially for families and beginners new to fishing. Fishing license can only be bought at the Kvennan Camping. We sell fishing license and fishing tackle. At the Kvennan Camping kiosk we sell, besides fishing licenses for the Kvennan Fly Fishing zone, licenses for other destinations in the Kvennan area. There are many lakes and rivers in the Kvennan area with a good populations of fish. We can provide all information you need just come to us in the kvennan Camping kiosk. We have a growing assortment fly fishing tackle. Special Glomma flies, tippets, leaders, flotants and some tying material and other accessories. We distribute fly rods and reels from Eikre-Fly. 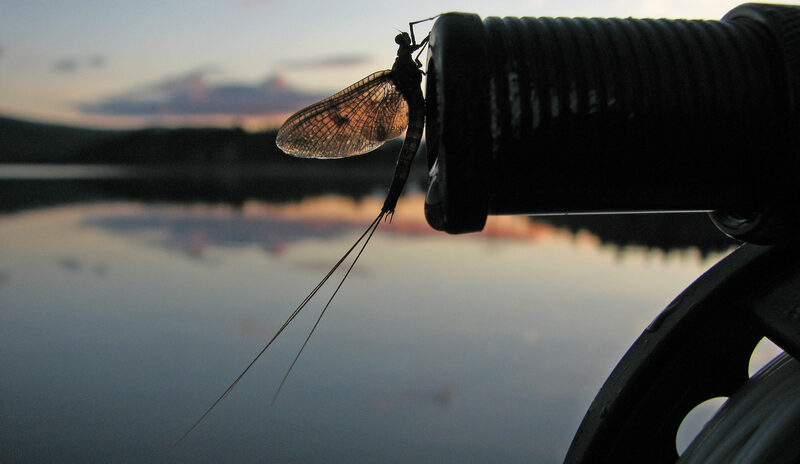 Our flies are all tied by anglers with good knowledge of the Kvennan section and the river Glomma. If you’d like a local guide on your fishing holiday, please send a request to one of the local fly fishing gurus; Hein Van Aar or Marius Tollan.